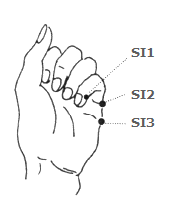 WHO : On the little finger, ulnar to the distal phalanx, 0.1 F-cun proximal-medial to the ulnar corner of the little fingernail, at the intersection of the vertical line of ulnar border of the nail and horizontal line of the base of the little fingernail. WHO : On the little finger, in the depression distal to the ulnar side of the fifth metacarpophalangeal joint, at the border between the red and white flesh. Note: When the hand is slightly flexed, the point is located at the ulnar end of the palmar metacarpophalangeal crease of the little finger. WHO : On the dorsum of the hand, in the depression proximal to the ulnar side of the fifth metacarpophalangeal joint, at the border between the red and white flesh. Note: When the hand is slightly flexed, the point is located at the ulnar end of the distal transverse skin crease of the palm, at the border between the red and white flesh. 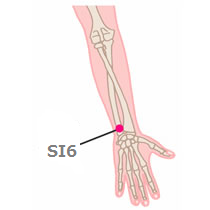 WHO : On the posteromedial aspect of the wrist, in the depression between the base of the fifth metacarpal bone and the triquetrum bone, at the border between the red and white flesh. 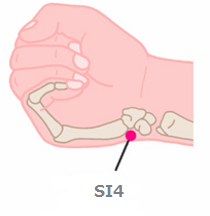 Note: With one finger placed on SI3, push and slide proximally along the fifth metacarpal bone to the bony projection, SI4 is located in the depression between these two bones. 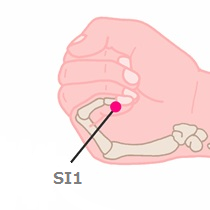 WHO : On the posteromedial aspect of the wrist, in the depression between the triquetrum bone and the ulnar styloid process. WHO : On the posteromedial aspect of the forearm, in the depression radial to the head of the ulnar bone, 1 B-cun proximal to the dorsal wrist crease. 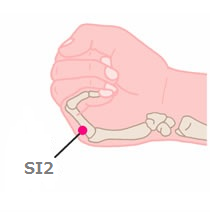 Note: With the palm facing downwards, press the highest point of the head of ulnar bone with a finger, and then turn the palm towards the chest; SI6 is located at the cleft between the bones where the finger slides. 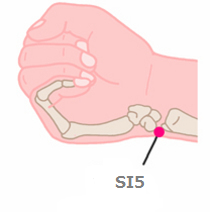 WHO : On the posteromedial aspect of the forearm, between the medial border of the ulnar bone and the flexor carpi ulnaris muscle, 5 B-cun proximal to the dorsal wrist crease. 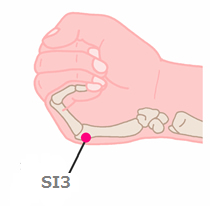 Note: 1 B-cun distal to the midpoint of the line connecting SI5 with SI8. WHO : On the posteromedial aspect of the elbow, in the depression between the olecranon and the medial epicondyle of the humerus bone. 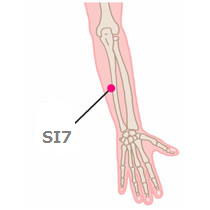 Note: When the elbow is slightly flexed, SI 8 is located in the groove for the ulnar nerve. 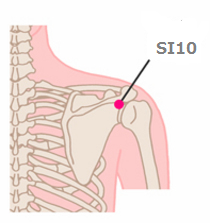 WHO : On the shoulder girdle, posteroinferior to the shoulder joint, 1 B-cun superior to the posterior axillary fold. 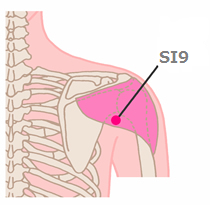 Note: When the arm is adducted, SI 9 is located 1 B-cun superior to the posterior axillary fold, posterior to the deltoid muscle. WHO : On the shoulder girdle, superior to the posterior axillary fold, in the depression inferior to the spine of the scapula. 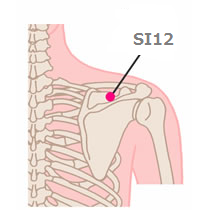 WHO : In the scapular region, in the depression between the upper one third and lower two thirds of the line connecting the midpoint of the spine of the scapula with the inferior angle of the scapula. 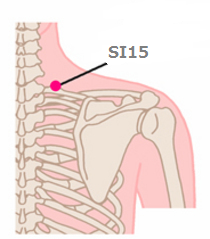 WHO : In the scapular region, in the supraspinatous fossa, superior to the midpoint of the spine of the scapula. 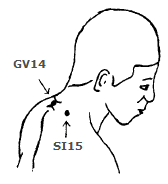 WHO : In the scapular region, in the depression superior to the medial end of the spine of the scapula. 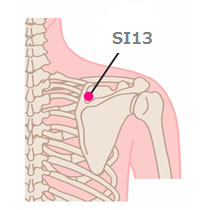 Note: SI13 is located at the midpoint of the line connecting SI10 with the spinous process of the second thoracic vertebra (T2). WHO : In the upper back region, at the same level as the inferior border of the spinous process of the first thoracic vertebra (T1), 3 B-cun lateral to the posterior median line. 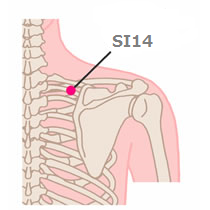 Note 1: SI14 is located at the intersection of two imaginary lines: the vertical line of the medial extremity of the spine of the scapula and the horizontal line inferior to the spinous process of the first thoracic vertebra (T1). 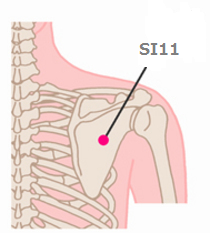 Note 2: SI14 is located at the same level as BL11, GV13, and the inferior border of the spinous process of the first thoracic vertebra (T1). Practical : From GV-13 陶道, 4 fingers outside. WHO : In the upper back region, at the same level as the inferior border of the spinous process of the seventh cervical vertebra (C7), 2 B-cun lateral to the posterior median line. 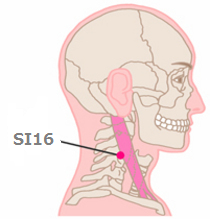 Note: SI15 is located at the intersection of two imaginary lines: the vertical line of the junction of the lateral one third and the medial two thirds of the line connecting the posterior median line with the medial border of the scapula and the horizontal line inferior to the spinous process of the seventh cervical vertebra (C7). Practical : GV-14 大椎, 3 fingers outside. 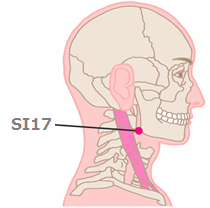 WHO : In the anterior region of the neck, posterior to the sternocleidomastoid muscle, at the same level as the superior border of the thyroid cartilage. 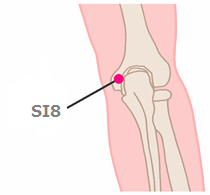 Note 2: SI16 is located at the same level as ST9, LI18 and the superior border of the thyroid cartilage. 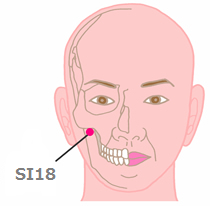 ST9 is located anterior to the sternocleidomastoid muscle, SI16, posterior to the sternocleidomastoid muscle and LI18, midway between the anterior and posterior borders of the sternocleidomastoid muscle. WHO : In the anterior region of the neck, posterior to the angle of the mandible, in the depression anterior to the sternocleidomastoid muscle. 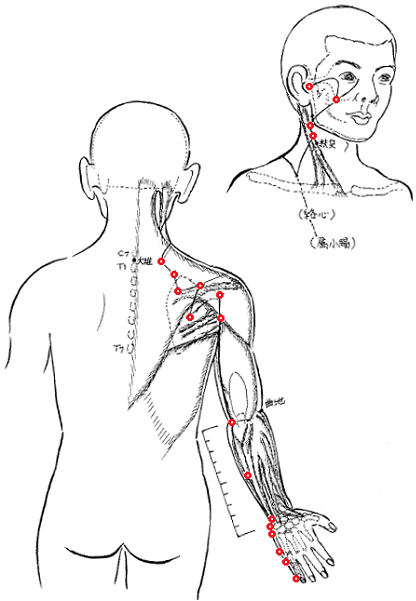 Note: The sternocleidomastoid muscle is more distinct when the head is turned to the opposite side against resistance. WHO : On the face, inferior to the zygomatic bone, in the depression directly inferior to the outer canthus of the eye. WHO : On the face, in the depression between the anterior border of the centre of the tragus and the posterior border of the condylar process of the mandible. 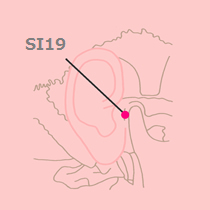 Note: When the mouth is slightly opened, SI19 is located in the depression anterior to the centre of the tragus, between TE21 and GB2.